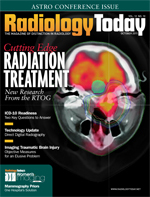 The September issue of the International Journal of Radiation Oncology features the results of three Radiation Therapy Oncology Group (RTOG) trials. The lead authors of the trials, which involve brachytherapy for localized prostate cancer, prophylactic cranial irradiation for small-cell lung cancer, and the use of prognostic factors for treating low-grade glioma, spoke with Radiology Today about these studies and their significance. The study was opened in 1998, Lawton says. The purpose was to look at whether seed implementation is a safe and effective treatment for localized prostate cancer when performed in the larger radiation community. The study involved 27 institutions. By design, no institution could accrue more than eight patients, “because then it ends up being a single institution study,” Lawton says. A total of 101 patients were enrolled, of which 94 were eligible. Patients included in the study had histologically confirmed, locally confined adenocarcinoma of the prostate clinical stage T1b, T1c, or T2a; no nodal or metastatic disease; a prostate-specific antigen level of less than or equal to 10 ng/mL; and a Gleason score of less than or equal to 6. At the eight-year follow-up, the overall survival rate was 88%. At last follow-up, no patient had died of prostate cancer or related toxicities. Three patients had maximum late toxicities of grade 3, all of which were of the genital or urinary organs. No grade 4 or 5 toxicities were observed. Lawton says the research team did not look at procedure costs, but many others have done cost analyses and brachytherapy is looked at as one of the least expensive ways to treat localized prostate cancer. The study is encouraging, she says, because not only is radioactive seed implantation a less costly treatment compared with some, but it also is safe and effective and has relatively little in the way of toxicity. Patients with limited-disease small-cell lung cancer tend to be responsive to treatment, particularly to chemotherapy, but they often relapse at sites such as the brain because the chemotherapy has difficulty penetrating the blood-brain barrier, Wolfson says. This study looked at whether small-cell lung cancer patients should be treated with prophylactic cranial irradiation and, if so, what the most effective dose was. Wolfson says this area of research has been of interest to him since after training, when he joined the radiation oncology faculty at the University of Miami in 1989. Those questions led him to a single institution study at the University of Miami of about 27 patients, the results of which he presented at the American Society of Therapeutic Radiation Oncology (ASTRO) annual meeting in 2000. At that time, he showed a survival advantage among the patients of doing radiation vs. no radiation. Since then, he says, a number of prospective studies also showed a survival advantage from doing preventive brain radiation. “The survival advantage at three years was something like 5%, which was statistically significant for the size of the analysis,” Wolfson says. At the same time Wolfson was completing his study, the European Organization for Research and Treatment of Cancer (EORTC), looking at the proper dosing for preventive brain treatments for patients with small-cell lung cancer. “They wanted to see whether giving a higher dose would increase survival more than the standard dose,” he says. The Europeans gave the higher dose in one treatment daily, while Wolfson looked at breaking it up into two doses per day. When Wolfson went to the RTOG and asked it to take his trial, he was asked to work with the Europeans. “I contributed to the European study that was finished in 2005,” he says. The study that is in the September International Journal of Radiology Oncology was presented at ASTRO in 2009. “And now the paper is out,” Wolfson says. It involved a total of 265 patients. Wolfson says the study shows that the standard treatment should be the standard of care and that more work is needed to evaluate patients neuropsychologically at the point of diagnosis. As with most studies, Wolfson says, “With every question we answer, we raise more,” and more research is needed to explore ways to give higher doses effectively and to identify the brain effects from the disease prior to chemotherapy treatment. Two EORTC trials developed a clinical scoring system that helps physicians determine the chances that a patient with a low-grade glioma will survive. The scoring system is used to help determine which patients to enroll in which trials and the course of treatment. For this study, the researchers took the European scoring system and applied it to an Intergroup trial in which 203 patients with low-grade gliomas were randomized to moderate or higher radiotherapy doses. Risk factors from the EORTC prognostic index, including histology, tumor size, neurologic deficit, age, and tumor crossing the midline, were analyzed for their prognostic value. The high-risk group was defined as patients with more than two risk factors. In addition, the Mini Mental Status Examination score, extent of surgical resection, and the chromosomal arms 1p and 19q were analyzed for prognostic value. The researchers found that the low-risk group as defined by EORTC criteria had a superior progression-free survival and overall survival rate to the high-risk group. Analyzing by the EORTC risk groups, it found that the low-risk group had significantly better median overall survival (10.8 years vs. 3.9 years) and progression-free survival (6.2 years vs. 1.9 years) than the high-risk group. For a small subset (66 patients), the researchers had some molecular data—1p19q—”but we did not work that into the scoring system due to small patient numbers such that it is entirely a clinical scoring system,” Brown notes. Brown believes the clinical scoring system proved helpful primarily because of the influence of histology and tumor size. Thus, Brown says, the researchers concluded that the EORTC clinical scoring system is a valid tool and still very useful in treating patients with low-grade gliomas, which, like all brain cancers, are on the rise. However, Brown says, the EORTC does not use genetic markers, and he believes that the best scoring system for determining treatment and who is enrolled in which trials will be one that employs both clinical considerations and genetic markers. — Beth W. Orenstein of Northampton, Pa., is a freelance medical writer and frequent contributor to Radiology Today.